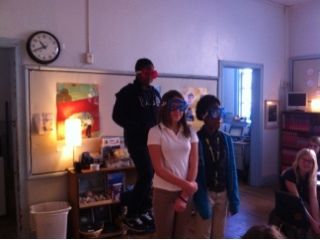 We donned our blue and red goggles and acted out the four fronts we've been studying in class. The first person to comment on this entry with the names of the four fronts and the weather associated with each will get a prize! You're half way there, Sarah! What weather is associated with each of these fronts? Great job, Sarah! See me on Monday for a CERES sticker and bookmark!